Discipline in the investment portfolio of the branches must be maintained at any cost. Investment circulars/instruction/procedures and norms should always be meticulously followed. Discretionary powers must not be violated. Without maintaining the investment sanctioning discipline, the clients can cheat with the bank and the investment may become overdue in the future. A sense of responsibility amongst the officials for proper investment and timely recovery of the Bank’s Investment to be developed. They must realize that they are not only accountable and answerable to the Bank Management, Shareholders/Directors but also to Almighty Allah. The client is not traceable. The client does not have any property to be proceeded against or the particulars of the client’s properties are not available. The matter has been perused with the client & the client either expressed inability to pay or does not respond. The client’s business has failed & he has asked for further investment to revive his business. The client is a local influential person & creates a problem for the bank if recovery is insisted upon. The client has died & responsibility of repayment of investment cannot be fixed up easily. Already criminal case or civil suit has started against the client & the case is lying pending in the court. To content with each kind of the above contingencies, the Branch Manager has to device appropriate tactics – both legal & administrative, which help the bank in the recovery process. Whether personal contract is made with borrowers and guarantors. How many letters written to the borrower. Whether any meeting arranged with borrower. Mood of response of borrower – prayer of waiver – rescheduling etc. Whether any irregularities found in sanction and disbursement. Date of last deposit in the account. Whether probable all measures are taken for recovery, if failed. Ensure regular follow-up with the lawyer and early settlement of suits. 1.To identify & review the causes of overdue/SMA/Classified Investment on each defaulter client on urgent basis, if not identified earlier. After identification of the causes of the same, initiation of appropriate measures must be taken for recovery of the defaulted investments. 2. Constant supervision, monitoring of defaulted investments along with maintenance of Register/Due Date Diary and follow-up should be geared up / intensified to recover/regularize the overdue/SMA/CL. 3. The branch must have effective control over its Murabaha(Pledge) goods against Classified Investment Accounts. Any leniency in this respect will shortfall of goods & bank will be a loser. 4.Persuasion for recovery be stressed instead of filing suits. Legal actions should be taken only as the last resort and that should be done timely or before time-barred i.e. as per limitation Act and Collaterals/goods of Murabaha/MPI to be sold through tender notice as per Arthorin Adalat Ain,2003. 5. Manager & Investment Officers should widen their social contract to re-identify the actual problem of the clients and arrange several discussion with the clients to solve the problem classified accounts. 6.All the members of Bad Investment Recovery Cell/teams of the branches should discharge their duties sincerely, efficiently and honestly with full responsibility. They should avoid the habit of by-passing the problems and exert their utmost efforts to overcome each & every problem. 7.Side by side to overcome the problems of classified investments all should be more cautious to regularize/realize the overdues & special Mention Account Investments, so that no overdues & SMA become classified in future. 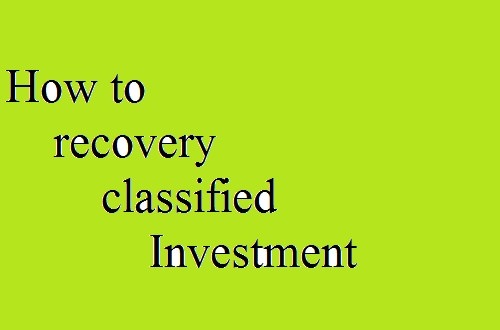 8.After ending of all the possible ways to recover the Classified Investment, the branch should take appropriate legal actions for recovery of the same before time-barred. a) To form Investment Monitoring & Recovery Cell in each branch under which more than one recovery teams should be formed for regular monitoring & follow-up/persuasion of all the overdue/stuck-up/classified investments. b) To hold meeting of recovery cell/teams weekly and review the weekly performance. c) Monthly follow-up and recovery program of each member of the cell/teams should be framed and cross check to be ensured by the branch manager/responsible executive/officer. d) Personal contact and continuous persuasion of the defaulted borrowers must be ensured by all the members of the recovery teams for expediting recovery of stuck-up/Classified Investment. e) To prepare list of “would be classified investment” to arrest further classification. “would be classified investment of a quarter are those investments of a branch which if not recovered in that quarter will be SMA/Classified in the next quarter. f) The Recovery Cell/teams will follow up/monitoring the investments by opening of Due Date Diary of the rescheduled accounts vigorously and ensure recovery of installments/lumpsum as per terms of reschedule. g) The Investment Monitoring Cell/Recovery teams of the branch will work on TOP-20 defaulters of the branch on a regular basis. h) Besides the above, all concerned officials of the Monitoring/Recovery Cell/teams should be well known the guidelines for waiver of Profit & Compensation against Investment of the Bank and updated instructions of rescheduling of continuous/Demand and HPSM/Term Investment and related section of laws e.g. Artho Rin Adalat Act. 2003, NI Act. 1881, Limitation Act. 1908 etc.i) The Branch monitoring and recovery cell/teams should be strictly followed the instructions regarding recovery of overdue/Classified Investment detailed as laid down in the Investment Operation Manual, Investment Risk Management Policy Manual, BRPD circulars of Bangladesh Bank, SIBL HO circulars etc. b) To hold meeting of recovery cell weekly and review the weekly performance. c) Incorporation in daily position of recovery of Classified Investment to place the updated position to HO & BB. d) Monthly follow-up and recovery program of each member of the team should be framed and kept ready in the file for verification by the visiting executives from Head Office. e) Personal contact and continuous persuasion of the defaulted borrowers must be ensured by all the members of the recovery team for expediting recovery of Classified Investment. f) To prepare list of “ would be classified investment” to arrest further classification. “ would be classified investment of a quarter are those investments of a branch which if not recovered in that quarter will be classified in the next quarter. Waiver of Profit & Compensation against Investment of the Bank. Amount to be obtain as Down Payment for Rescheduling of Continuous/Demand and HPSM/Term Investment. Updated instructions on re-scheduling of investment etc. All the participants should be carefully noted down the causes of overdues/defaulted investments and the preventive/remedial measures as suggested above to stop/arrest the same and take appropriate steps without further loss of time in the light thereof not only to recover/regularize the existing overdues & Classified Investment but also to arrest the increasing trend of overdues & classified investment and ultimately to stop it all together.